do me a favour? sell me that airtime? IT’S happened to me twice so far over a four week period in two different parts of Kampala. Luckily, it’s not a daily occurrence otherwise I would have given up on using a mobile phone a long, long time ago. The first time, I was walking home and decided to buy a little airtime just in case I ran out in the middle of the night. Going past the turn-off up the hill that I should have taken, I stopped at the first of one million shops selling airtime alongside sugar, iron sheets and boda bodas. “Wa mekka?” (For how much?) the chap asked me, seemingly disinterested. I was sweaty and had a laptop bag slung over my shoulder but surely looked respectable enough for him to unfurl himself and attempt to take my money? I was trying my luck and thought my tone conveyed that. I didn’t want to give a wrong answer and get sent away, just in case there was some rule I wasn’t aware of. But even as I responded the thought occurred that I could have walked into some spy secret set-up and the guy would hand me a box of spy stuff if I accidentally got the code right, and my life would change forever as I became a target of various global security teams. I needed more information – did he mean he did not have Ushs20,000 worth of airtime or that he didn’t have one single Ushs20,000 airtime card? Ten seconds I stood there just about to ask him to clarify but he was looking elsewhere, having closed that chapter. Of course, I should have gone to the next shop, but I asked all the same. “Nnina za lukumi lukumi zokka!” (I only have Ushs1,000 airtime cards!) he responded, still not looking at me, still seated in his chair. He had a very bad posture, I noticed, and if he had been more polite I would have helped advise him to change it so he didn’t end up with a painful back in his old age. As it was, I chose the long game for his punishment. The short game situation, I quickly realised, is the reason why they put bars in the front of those shops as if they are prison cells. Not to lock the stupidity in with the merchandise, but to stop people like me from snapping and committing regrettable acts that would probably soil the merchandise with blood and gore. Three shops later, I made a note to self that telecommunication companies need to revise that part of their training manual that has all these retailers responding in this manner. The young girl sold it to me. Then I asked for another. THAT’S when I checked my credit balance to confirm whether I really needed to continue with the circus – especially since I was walking further away from my home. We question-duelled till he gave way and counted how much he had in his drawer. “I’ll take it all,” I said. Eventually I got to this most progressive shop – larger than the rest and with no metal bars in the doorway. Realising that if I didn’t fill my phone up with airtime as soon as possible I might spend the rest of my life buying it up in drips and drops, I asked this fellow for more – Ushs50,000. He ran a Mobile Money outlet after all. He had those glass display cases in his shop. He also sold mobile phone accessories. Surely he would have airtime available to sell. Again, an exclamation that didn’t sound like the one I hoped for – I needed to hear that ‘Ha’ of a man gleefully calculating the profit he would make off his purchase, and maybe even betraying some relish at the possibility that he could sell me some earphones or an extra charger. I was about half a kilometre away from the turn-off point home, and thirty minutes off schedule. My patience had run thin and I had no more laughter to hold in whenever these people did these things. I needed the airtime. “Man. Nyamba!” (Help me, man!) I pleaded. I was breaking a rule I have held fast to for years and years; abdicating my role as customer and betraying all my kinfolk in the economic stratum of those with disposable income, therefore frustrating the rules of economics relating to supply and demand. My secondary school economics teacher would have rubbed his chin and proclaimed a lack of surprise as he recalled my distracted antics in his class, even though he can’t have my test papers to present as proof that this was how I would end up. The shop attendant thought a little bit, progressive fellow, and a lightbulb went on in his mind. Off he went, leaving me alone in his shop with all his merchandise and that drawer containing airtime cards and even some cash. Unlike the first chap I stopped at, this one disregarded my dishevelled looks enough to trust me with his shop as he shot across the road. Five minutes later he was back, waving three airtime cards – two for Ushs20,000 and one for Ushs10,000. “Nzifunye!” (I got them!) he declared triumphantly, with some irrational pride in his voice. I gave him the Ushs50,000 and he was off again to pay the person he had sourced the cards from. When he got back, he offered to scratch my cards and opened the drawer to extract an implement for doing so – a coin. As he did so I got a good look at a collection of airtime cards amid the small notes of cash and other bits and bobs. I didn’t want to ask, just in case he answered in the affirmative, but after he had scratched the cards and as I was loading them I could resist no longer. How much did he have of this much-wanted airtime, but in small denominations? He STILL didn’t quite get it. So I bought that, too – kind of as a token of appreciation for his having gone out of his way to get me the Ushs50,000 cards. I cringed after placing the order, afraid that he was going to protest having to sell all his stock in one fell swoop. Luckily for my nerves, he made no such protest. “Webale nnyo, boss!” (Thanks a lot, boss) he said – the very same words I had said to him a few minutes earlier. the scourge that is artisans and tradesmen around my home – and oba how does the askari not see it? DECEMBER-January at around this time puts me in dangerously close proximity to a variety of tradesmen, artisans and workers, because it is officially annual maintenance and repair time at my home. This is the month I find it easiest to stop for a few days to do some serious general repairs to polish off all my D-I-Y projects using supposedly professional help. I decided long ago (as Whitney Houston once sang) to focus all my work on a limited number of these people, in order to decrease the likelihood that I would one day commit slaughter upon one. Through a painful and costly process of trial-and-error-and-elimination, I have over the years selected the best of all the tradesmen, artisans and suppliers in each category, and put them to work in bits and pieces. That means, for instance, that instead of hiring one to do a large job like, “Paint this house” in one sweep, I bring the guy in and assign him about two and a half walls every other week, under close supervision. The gardening guy cannot be allowed to cut the grass, shape shrubs, trim branches off the larger trees, do pruning and also sweep up the cuttings all in one day. It’s generally been a smooth run so far, this time round, except for this one guy. About four weeks ago a concatenation of events led to the glass top of a patio table shattering into bits late one night in a manner that could only be blamed, if anyone attempted to do so, on me. It would appear that the domestic staff had a meeting to discuss the likely suspects and worked it out quite easily since, when the crash was heard in the deep quiet of the night, the askari had only recently allowed me in through the gate. Long story cut short, I commissioned a new table top to be fashioned out of some floor tiles that had stayed over from a long-past job. The matter was straightforward: 1. Get the left over tiles 2. Arrange them to form a table top 3. Get paid. The fellow agreed, nodding to indicate that he had understood what I was saying. I looked at the table top for about two minutes, working up the courage to walk over to it and check whether the tiles had only been perched there temporarily. They were permanently placed there. Flabbergasted, I called in my eleven-year old to confirm to me that I had not taken leave of my senses, and he laughed uncontrollably. I then set about on a search of the perimeter to establish whether we had simply not provided enough tiles for the project. There were so many tiles that he could have laid two layers of them over that table. Flabbergasted, I called in the askari to ask his opinion. He stood there, quite blasé, and we both observed the table for a while until I realised I had to break the ice. “What do you notice is wrong with that?” I asked. “The glass got broken, sir. But I don’t know for sure who broke it,” he said. “Er…” he started, leaving space for me to give him a hint. “Well? What do you notice is wrong with that?” I asked again. “It has…dust?” he asked, clearly worried that the duty of cleaning the table might have been passed on to him without his notice. “Don’t you find it awkward that this tile is here like this, for instance?” I asked, pointing at the green tile. He looked at me to check whether I had lost my mind. I also gave up, and summoned the fellow who had done the table. Within minutes, he was there and taking me through the very same conversation I had just had with the askari. I kept my patience right to the end and couldn’t help asking whether, in all seriousness, he didn’t find the green tile awkward. I could not get enough of that silenced look. (Of course I made him fix the damn table). Starting the day out normally for a seasoned Land Rover driver, I made up my mind to walk to the stage and get a taxi after my car failed to start. I had an urgent series of meetings to attend, and was not going to risk being late. Confounding the askari at my gate, I threw my laptop bag over my shoulder and stalked out while making a phone call in Bruno’s direction. The plan was simple – take a taxi headed in the direction he was going to depart from, and meet somewhere midway. Rather than call him up though, I called up his real boss a.k.a. my wife. She often undergoes tribulations with the chap but not on the scale that I suffer, which makes me believe that she has better communication skills when it comes to deploying Bruno. She voiced a clear understanding of the situation and didn’t even offer an endearment as she dialled off to dispatch the fellow. I made it all the way to the taxi stage, into the taxi and through the process of arguing with the conductor a little bit so he wouldn’t cheat me out of Ushs200, until I was standing on the forecourt of the Total Station in Nakawa. 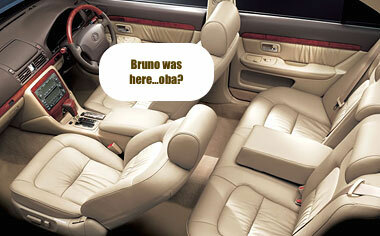 At that point, I realised that I should have seen Bruno’s car by then. There were not many vehicles there and a limited number of options open to a driver for parking a motor vehicle in a manner designed to aid the collection of a waiting principal. I looked round again and confirmed that he was not there. I then recalled a similar incident earlier on and a sense of dread began to weigh down on my forehead. Supposing he was at the Shell in Nakawa? That small one up there, just after the traffic lights? Or the one further on? I knew it was in Naguru along Stretcher Road, and not Nakawa, but this was Bruno…? I realised that I was going to be late for my meeting, and whipped out the phone to call up with apologies, wondering whether to mention Bruno’s very existence in my life as a cause, when I noticed that he had tried to call me about five minutes earlier under the sound of taxi chatter. The next few minutes were going to be painful or full of mirth, I figured, so I sent meeting apologies just in case I didn’t get hold of the chap, then called Bruno up. I no longer laugh at this. Also, I gave up trying to make it stop. I just allow it to happen, so the time it takes to get past it is built into my expectations of these interactions with Bruno. So I leave him “there” and probe further. I stopped a little bit and allowed the brain to churn. I had noticed some construction work going on near the garage bays at the top of the fuel station, but that couldn’t possibly be called “new buildings”. The works actually depicted mounds of soil extracted from the bay itself, rather than any new construction. As I squinted to establish whether or not Bruno’s car was underneath one of those mounds of soil, I realised that in front of me, above Total Nakawa, was the UAP Business Park. Without leaning on the investigative power of the likes of Sherlock Holmes or Grace Akullo, I solved the case. Two weeks ago, I had had Bruno pick me up from those very same “new buildings” that make up the UAP Business Park. He must, therefore, have gone there on hearing the ‘Nakawa’ part of “Total Nakawa”. 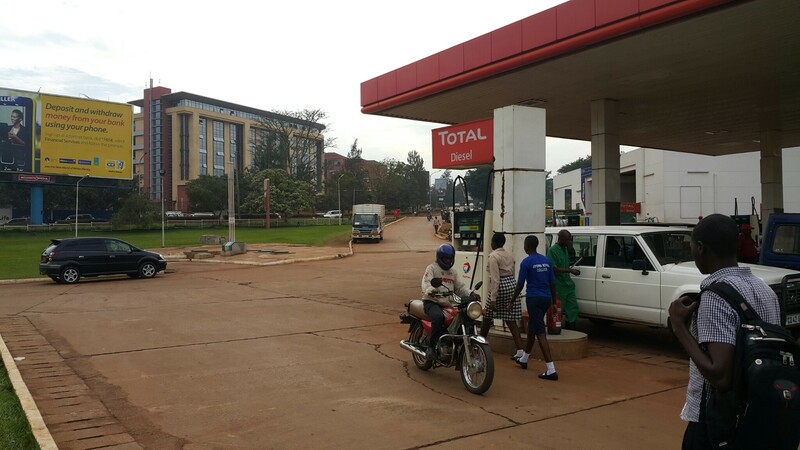 Five minutes later, he drove into the fuel station – not from the Old Port Bell Road as you would expect if you are in any way familiar with this part of town, but from the main Jinja Road. I walked over to his car and made myself available to him as a calm passenger before asking him WTH.